GAIL (India) Limited, a Maharatna PSU and India’s flagship Natural Gas company is integrating all aspects of the Natural Gas value chain (including Exploration & Production, Processing, Transmission, Distribution and Marketing) and its related services. In a rapidly changing scenario. GAIL is also expanding its business overseas to become a formidable player in the International Market. GAIL (India) Limited, invites applications from Indian nationals fulfilling the eligibility criteria for filling up Executive Trainee, as per category wise vacancies indicated against each post through GATE-2016. Committed, vibrant and passionate young Graduate Engineers may apply Online for GAIL Recruitment 2015. 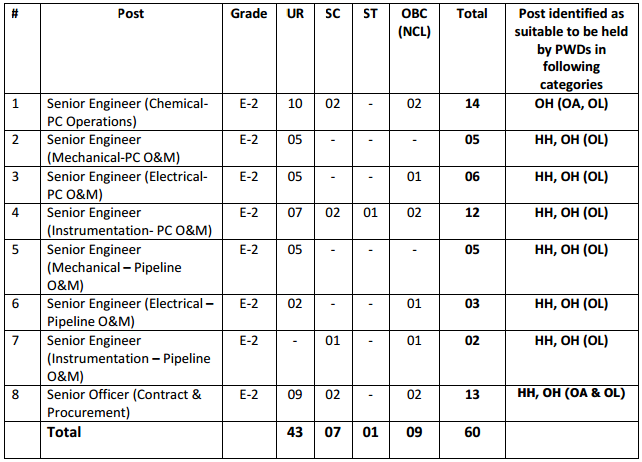 Category wise vacancy for GAIL Recruitment 2015 is given below. The post-wise vacancy position indicated above may increase or decrease depending on the organisational requirement. In case of any change, the same shall be notified on GAIL website at the time of opening of GAIL website for online submission of application by candidates. Full-time Bachelor Degree in Engineering in Chemical/ Petrochemical/ Chemical Technology/ Petrochemical Technology with minimum 65 % Marks. Full-time Bachelor Degree in Engineering in Mechanical/ Production/ Production & Industrial/ Manufacturing/ Mechanical & Automobile with minimum 65 % Marks. Full-time Bachelor Degree in Engineering in Electrical/ Electrical & Electronics with minimum 65 % Marks. Full-time Bachelor Degree in Engineering in Instrumentation/ Instrumentation & Control/ Electronics & Instrumentation/ Electrical & Instrumentation/ Electronics/ Electrical & Electronics with minimum 65 % Marks. 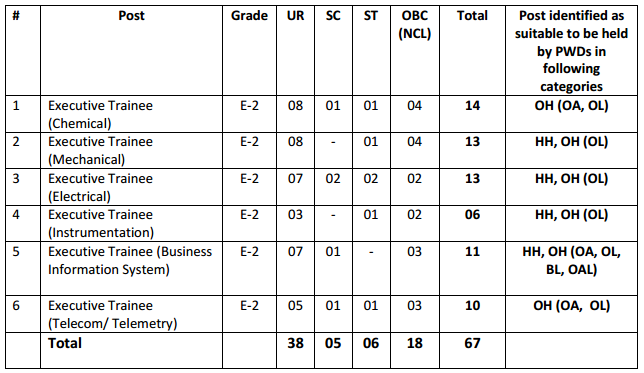 Full-time Bachelor Degree in Engineering in Computer Science/ Information Technology with minimum 65 % Marks OR Full Time Bachelor Degree with minimum 60 % marks and 03 years Full Time Master Degree in Computer Application (MCA) with minimum 65 % marks. Full-time Bachelor Degree in Engineering in Electronics/ Electronics & Communication/ Electronics & Telecommunication/ Telecommunication/ Electrical & Electronics/ Electrical & Telecommunication with minimum 65 % Marks. The upper Age Limit is 28 years as on 29.01.2016 for the posts of Executive Trainee in all disciplines. The upper age limit is relaxable by 05 years for SC/ST candidates and 03 years for OBC (Non-Creamy Layer) candidates. In case of Ex-servicemen not exceed by more than 3 years the maximum age limit prescribed for the posts/ services for which a candidate seeks appointment, he/she be deemed to satisfy the conditions regarding the age limit. Eligible candidates who wish to apply for the position of Executive Trainee in GAIL will be required to first apply for GATE-2016.The candidates will receive their GATE-2016 Registration number. After applying online, candidate is required to take a printout of the Application Form generated by the system with unique registration number, space for affixing photograph and signature and other details. The candidate has to affix his/ her recent passport size colour photograph and put his/ her signature at the space provided and keep it with him/ her safely. Candidates called for Group Discussion and/ or Interview will be required to produce the same documents at the time of Group Discussion and/ or Interview. Candidates should not send this printout to any office of GAIL (India) Limited. The passport size photograph affixed by the candidate should be same as submitted along with GATE-2016 application form. Candidates are required to produce following documents during GAIL Recruitment 2015 Interview. Complete and proper Experience certificates/ Documents issued by the Employer in support of experience details mentioned by the candidate in the online Application Form. Candidates belonging to SC/ST/OBC category should produce their caste certificate in the prescribed format issued by Competent Authority as prescribed by Government of India in support of their claim. Ex‐servicemen Proof (in case of Ex‐servicemen candidates). NOC/ Forwarding Letter from the employer in case the candidate is employed in Central/ State Government Department, Central/ State PSUs or Semi Government organization. Based on the GATE-2016 score and requirement, candidates will be shortlisted for Group Discussion and/ or Personal Interview for the position of GAIL Executive Trainees in the above disciplines. Please note that only GATE-2016 score is valid for this recruitment exercise. GATE score of 2015 or prior to that is not valid.